I like the convenience of having a backpack when I ski. Last winter one of the lifties at the local ski hill gave me guff about my backpack, claiming that it was unsafe. I wore the same backpack to different slopes around the Northeast US all winter, and he was the only person to ever say anything about my backpack being unsafe. Is it unsafe to ski or ride the chair lift with a backpack? If so, what are the associated risks? With a dash of common sense, and a modicum of skill I'd say packs are safe on a chairlift. One winter I skied over 100 days at Jackson Hole Mountain Resort. I wore a pack the vast majority of those days. I never once felt that any of my packs at any time were decreasing my safety or the safety of others on the lift, tram, or gondola. Chairlift accidents happen, too, but the greatest dangers on lifts come from inexperienced skiers slipping during loading, or children and distracted riders falling to the ground. In December 2014, a woman caught her ski on a support pole at Hunter Mountain in New York and fell to her death. Colorado is one of the few states that require resorts to report injuries resulting from lift falls. In the past five years, 74 people were injured falling from lifts in that state, according to numbers provided to Outside by the Colorado Passenger Tramway Safety Board. The agency classified three of those as the lift operator’s fault. Don't wear a big or bulky pack. While seated carry the backpack on your lap, with only one arm in one strap, and any waist belt unbuckled. This way you can sit fully back in the chair, ensure your pack's straps don't get caught in anything during the ride up, and it is easy to ditch the pack in the unlikely event it gets caught on something. If you feel uncomfortable lower the safety bar. This is a good safety tip regardless if you are carrying a pack or not. Don't carry a pack until you can get on and off the lift smoothly. If you can't do that then you don't need the extra concern. Don't carry a pack if you are nervous on chairlifts. If you are already worried then you don't need extra gear to worry about. If you ever feel uncomfortable mid ride you can always hook an arm over the back of the chair lift. That will dramatically reduce your already slim odds of falling off the lift. Once again this can be done if you're wearing a pack or not. Follow lift operator directions. If the lift operator is giving you instructions that you feel are unreasonable exit the line and bring the issue up with the administrative team at the mountain. If the mountain has a strict no packs policy then evaluate if you want to continue to ski/snowboard there without a pack or take your business elsewhere. Like I said at the start I don't think wearing a pack is a big deal. Keep in mind you've already decided it is safe enough to sit on a chair suspended several stories in the air with strangers in possibly windy and icy conditions. Once you've made that decision, wearing a pack responsibly probably isn't going to be the straw that tips this activity into "unsafe" territory. The first major risk, mentioned by Paparazzi, is hangups. These occur anytime the pack becomes entangled in the chair. These occur fairly frequently when unloading especially with chair riders unfamiliar with the hazard. The danger is compounded with inattentive lift operators as the likelihood of going "around the wheel" and being exposed to real danger goes up. The second major risk is a slip off the seat. Since the backpack occupies horizontal space the rider has less area to sit and the riders weight is centered much closer to the lip of the chair. My ski area uses deeper chairs to mitigate the issue. Slips tend to occur mostly during loading. A common time for a generalized slip which does not depend on packs occurs when the bar is moved upwards in anticipation for unloading. This risk for this type of slip increases with the use of a pack. As Pont pointed out in the comments a pack will push you closer to the swing space of the safety bar. This makes bar strikes more likely if when you aren't paying attention and/or your fellow riders don't provide a warning they are moving the bar. While there are increased risks packs also reduce risk. The can provide fall protection, additional warmth, and obviously carry supplies which can reduce risk depending on what you bring and how you use it. While they are a hassle for lift operators, ski areas have not banned them likely because the real risk of injury or death combined with lift operator frustration is far less important than lost skier dollars to those who prefer to carry their lunch, water, avalanche gear etc). Source: At the ski area I frequented for several years backpacks were common since they were mandated and lightly enforced for the hike-able terrain (which accounted for much of the ski areas draw). As a ski patroller for many years I usually have a pack on when riding the lift. Yes packs can be dangerous, but it is a manageable hazard, and a potentially life saving and life saving and required accessory depending on where you are skiing. People need to be educated about the hazard and how to mitigate it! You determine the hazard by how you wear the pack, and what pack you choose. The primary hazard comes from loose straps or pockets that can catch on the lift. A set of suspenders, safety leash or any other loose garb could have the same potential. All too often is see people on lifts with ski straps and compression straps dangling waiting to catch on the lift. This is like asking to get hung up. The best option is to remove the pack when riding the lift or move it to the front, but it is important to clip loose straps when you do this so they they are less likely to catch. The only time i personally have ever had a pack catch on a lift was with it was hanging from one shoulder with the waist belt undone, but it slipped off and went around the bullwheel without me. As a patroller we are often transporting gear with us on the lift and removing the pack is a not an option. As such we maintain awareness of our equipment. Prepare for getting off the life checking the you are clear and wear a clean pack with minimal and or stowable exterior straps. The packs I currently use for for patrol have a clean pocketless and strapless exterior. When I am skiing 100% inbounds I wear a Black Diamond Bbee which is clean and has nothing to catch. It is also low profile, such that I barely notice it when sitting on the lift. When I need heavy gear I currently wear a BCA Stash pack with a completely stowable ski carry system (no exposed straps!). I actually tape excess tails on straps to keep them from dangling from my pack so they don't flop around, but it also makes them less likely to catch on the lift. 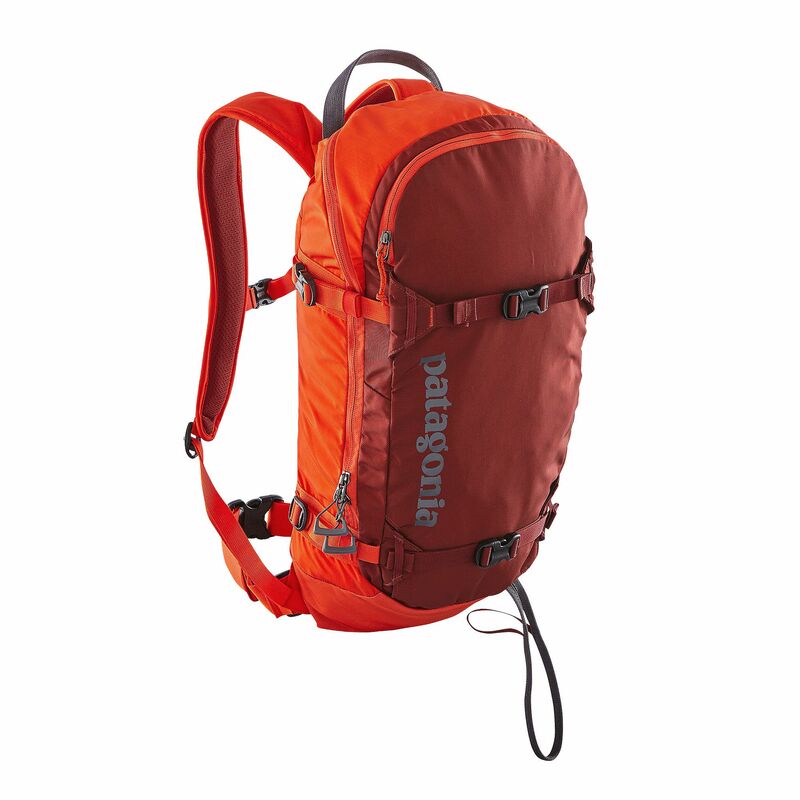 There are many other ski packs that are clean and low profile, but there are also many packs that have dangerously exposed straps and buckles that are best kept clear of the lift. As a buyer you need to look out for this as pack companies are not designing their packs for lifts. 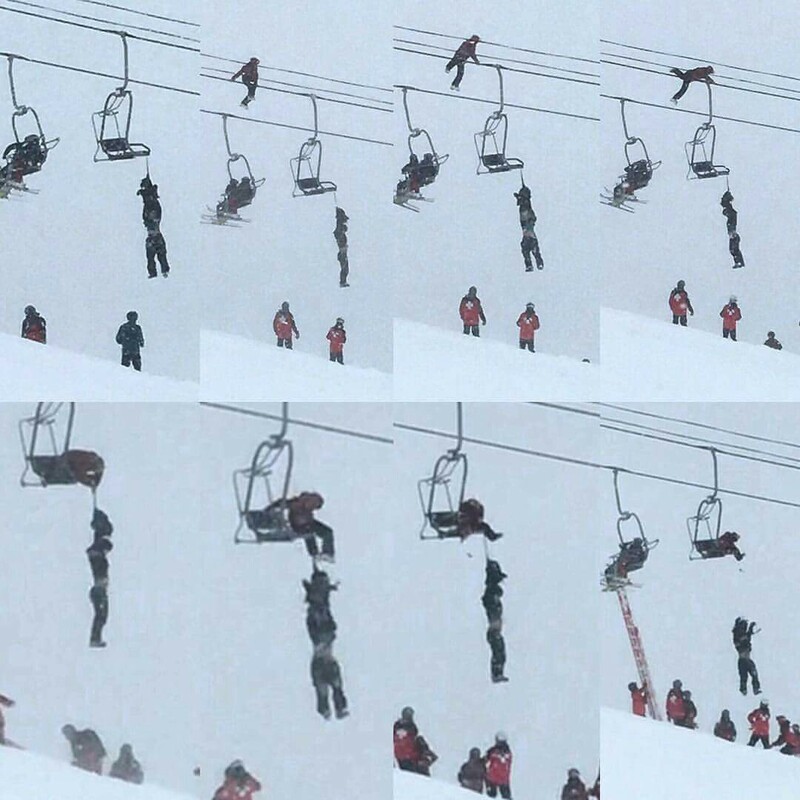 As people are likely to post references to packs here is self inflicted case of a snowboarder who got hung up by his safety leash, and a man who ended up upside down a hung by his trousers. I also remember an incident at a mountain where a man was saved by a friend when he passed out for medical reasons and was caught by his friend as he was falling out of the chair by his pack. In many (possibly all) European ski resorts it is mandatory to lower the safety bar in a chair lift. On the chairs I have ridden there is not enough space to sit down while wearing a backpack - I am referring to a backpack that has things in it, such as off-piste gear and a bit of spare clothing. Even if you do not want to lower the safety bar on a European chair you are likely to find your chair companions want it lowered. I have been on chairlifts where someone choose to wear their backpack on the lift, they found that the safety bar could not be lowered because their head or upper body obstructed the bar. Like large numbers of other chairlift users I always took off my backpack and carried it up held against my chest, or sometimes on the chair beside me if there was space. On one occasion out of many ascents a strap got caught as I left the chair. I had to abandon the bag, but as it was not tied to me I could safely let it go. The bag tripped the safety bar and stopped the chair allowing easy retrieval of my bag. It is dangerous as it can hang up and it places you more forward in the chair (slip off). A hip pack is a much better option as there is a gap in the chair for the hip pack. I ski patrolled with a pack as I carried some rescue gear and would carry skis to areas the lift did not go to. Before you get on the lift take it off, clip the hip belt to reduce dangling straps, and wear it backwards. Yes, it can be potentially very dangerous to ride a chair lift with a backpack. Here is a story (warning semi graphic pictures) about a guy wearing a backpack on a lift and it getting snagged. The guy's pack ends up tangled around his neck, leaving him hanging unconscious 10 feet in the air. Luckily, his friend was able to save him before any thing really bad happened. The liftie was right to inform you of the dangers. The backpack straps and buckles can easily get caught on the back of the chair. As a Director of a Ski School in France 'Ski with Ease' we always inform skiers of the risks and inform of best practice to remove and place on your lap. It doesn't matter if you are an experienced skier or not, it only takes a second to get caught.. Ski trouser braces dangling to look cool are another that I have witnessed getting caught on lift exit. Avoid wearing rucksacks wherever possible as they are going to affect your balance over the center of your skis. Of course off piste skiing they would be a must to carry probe and shovel etc. Not the answer you're looking for? Browse other questions tagged safety skiing backpacks or ask your own question. What is the use of this cord on my backpack?